Grieving is a normal healing process that moves us through the core sadness caused by a death. 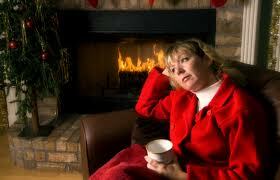 But coping with grief can be hard, especially during the winter holidays. The most intense grief typically arises after the loss a child, a spouse of many years, or a parent, and in cases of unexpected death and suicide. Some people use grief to stay connected with their late loved ones, believing that a return to normal, however brief, will break the link. Such obsessive grief really serves to dull unbearable feelings of alienation. When reconciliation with the dying was not achieved, grief is greatly exacerbated by guilt or anger. A big component of all grief is helplessness, brought on by mainstream social beliefs. We are taught that we can’t know whether the deceased survive and that we can’t communicate with them to find out. We are also taught that death is a failure we were unable to stop. Changing these beliefs will change the face of grief. Grief-management policy has only slightly improved in the last thirty years. Formerly, bereavement specialists encouraged mourners to cut all ties with the deceased. The current trend is to stay connected, mostly through acts of remembrance, such as looking at the deceased’s photographs, writing them letters, and recalling happy times. Although such coping strategies are useful, they are not enough, as bereavement counselors themselves admit. The most effective methods are also the most controversial – maintaining ties through direct communication with the departed. A number of avant-guarde organizations offer healing and support by providing high-quality material on survival after death. Most also provide individuals with certified channels for afterlife contact. Induced After-Death Communication Therapy, now practiced worldwide, uses techniques to connect patients directly with their departed. It is proving to be the fastest, surest way to eliminate the core sadness of loss. It is especially successful in curing death-related traumas, including post-traumatic stress syndrome. Communication with the other side is now a documented fact. Everyone has the ability; in fact, it’s hardwired in the human makeup. Contact with the departed, facilitated or not, almost never fails to turn grief into euphoria and revelation. The dead are the best bereavement counselors around. People who are already grieving before a loved one dies rarely get the help they need. A strong factor of anticipatory grief is, again, helplessness. We watch our loved ones “fail” and can do nothing to stop it. The antidote is to participate in the miraculous aspects of the death process, aspects that more and more caregivers are recording. Medical personnel, hospice nurses in particular, and family members are beginning to recognize the enormous spiritual power of the dying. The dying’s expanded awareness , or “nearing-death awareness,” includes deathbed visions of the afterlife and super-real encounters with late friends and relatives. Since caregivers are increasingly alert to the phenomena around the dying, many are now able to perceive them themselves. Ever more physicians and nurses are also having shared-death experiences. At the moment of expiration, they perceive and internally experience their patients leaving their bodies. Even if you don’t have direct perception of the phenomena that occur during the dying process, just knowing about them will allow you to engage in your loved one’s dying with awe rather than grief. It will also make you a better caregiver. What instantly brings up grief is the intrusive memory of your loved one’s last moments in physical life, a memory that is usually intolerable. Those moments are insignificant to the departed, remembered, if at all, like getting over any illness. Deceased accident victims frequently assure us that they felt nothing when the accident occurred, but just popped out of their bodies. If you find yourself fighting back shock and tears when the memory of a death intrudes, immediately switch to images of how your loved one is now in the afterlife — young, whole, and impossibly vibrant. Grief also surges when the object of your grief is standing right by you. When you experience a wave of grief, stop what you are doing. Go still and look inwardly for images or messages. Once you locate something, start communicating. Pour out your grief, or whatever else you’re feeling. Speak to the departed with your deepest, truest emotion, even if it is anger. You’ll be surprised at how often that grief wave turns into two-way communication, bringing you not only immediate relief and reconciliation, but also elation.